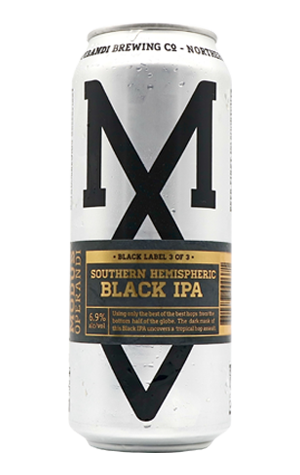 The third of the Black Label series beers to leave Modus Operandi's Mona Vale brewery in winter 2018 is a kind of Southern Hemisphere spin on their hugely popular Cascadian Howl. We say "kind of" as it's close to black and chock full of hops, but it's also not as big or dense on the palate. The main point of difference, however, is the provenance of the hops, all of which come from Australia and New Zealand. They're set to work in a beer that, were you to present to a blindfolded mate, ask her to take a whiff and tell you what was under her nose, she'd likely say some form of hoppy pale or IPA; certainly, the chances of picking it's black would be slim, as tropical fruits and creamy mandarin aromas lead the way. The illusion is shattered somewhat on the palate, as the roastier, dark chocolate malts poke their heads in, while working in harmony to do that thing dark malts and punchy hops can do when dancing together in large quantities: perform a herbal/liquorice liveried tango. The Southern Hemispheric winter is then wrapped up with a resinous bitterness while spring waits in the wings.